The water cistern is here! 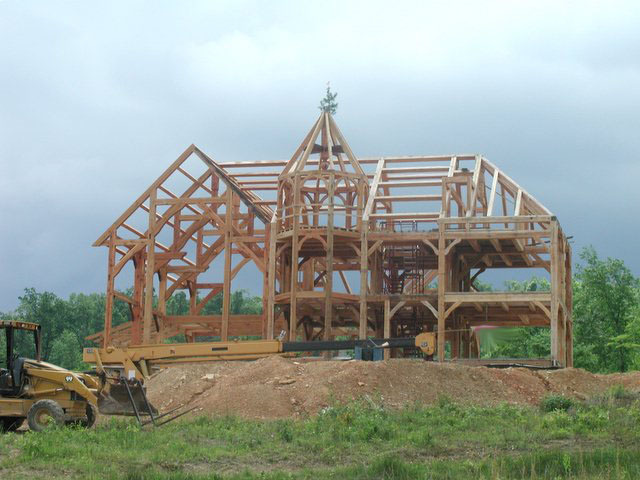 When I set out to build our house, I wanted every stick of wood to come from our farm. Practicality reared its ugly head, and I've modified that goal to "every timber, some of the t&g ceilings, and most of the floor joists." My other pie-in-the-sky goal was to be completely off the grid. That's a goal I'm sticking to! The off grid solar power at the house site has been on line for 20 months, and it has been much more reliable than the utility power at the mobile home we're living in. Electicity... done! But now it's time to think about our water source. Public water lines pass through our farm. In fact, we ran 3000 feet of pipe, at considerable expense to us, in order to hook up our mobile home to public water. The endless supply of reliable clean water is great, but frankly because of the chlorinated smell and white powdery sediment, the public water is less than ideal for drinking or washing dishes (and the sediment wreaks havoc on hot water tanks and coffee makers). We're resolved to collecting and purifying our own water at the new house. The next step in our rain water catchment project will be to add gutters to the back of the house and plumb them to the cistern. I've seen plans for automated (and manual) setups that allow you to "waste" the first few gallons of water from the roof during a rainstorm so that recent bird-poop, soot, leaves, and what not does not flow into your water catchment. Sounds like a good idea to me. A rain shower which produces 1 inch of rain on 1000 square feet of roof should yield about 500 gallons of water. I think we use about 50 gallons of water a day for flushing and clothes washing, so each good storm should give us about 10 days of wash/flush water, and the cistern will hold a 24 day supply. Of course, we can always fill the cistern with the well water... if we can develop a good well somewhere near the house. At the end of one week, this is all we have completed. :( Some of the stones in this picture are bedded in mortar, while some of them are still loose. We have relaxed the tolerances on the grout joints a bit, so the grout will be more likely to flow into the joints (when we get to that part!). Because of the variations in stone thickness (3/8 to 1"), I'm finding it difficult (but not impossible) to keep the stones level with each other. Before the (thickly applied) thinset hardens, the thinner stones sink a bit. I've started resorting to shims made from scrap hardibacker to prevent this from happening. Seems to work. One key element of passive solar design is to provide lots of roof overhang on south facing windows. Because the sun is higher in the sky in the summer, the overhang (if designed properly) prevents direct sunlight from impinging on the windows in the hottest months of the year. In the winter the sun is lower in the sky, so the overhang will not impede the sun from striking the windows and providing welcomed solar heat gain. All summer, no direct sunlight has entered our great room through the large south facing windows. Recently, it has been cloudy and rainy in Kentucky, so the sun's rays haven't even reached the house. Today was sunny though and I was pleasantly surprised when I looked into the great room and saw a sliver of light beaming in on the floor. By December, this sliver of light will grow and move across the room, such that the entire north wall of the great room will be illuminated by direct sunlight passing through the south facing windows. I love it when the math works out! It's still warm here in Kentucky, so ideally the sun wouldn't start peaking through for another month, but the warmest month (July) does not coincide with the sun's highest point in the sky, which occurs in June. Nor does the coldest month of January coincide with the sun's lowest point in the sky, which occurs in December. Therefore it was necessary to allow a little sun in the house in early September so that the benefits of passive solar heat gain could still be realized in late March. Life's a compromise. I dug around and found this picture of the south side of the house that was taken at around Halloween 2007. As you can see, the sun (due to its annual journey to a lower position in the sky) is already fully illuminating the upper windows in spite of the overhang. Yep, that's how it's supposed to work! The west side of the house has very few windows, because the sun always sets in the west, no matter what time of the year it is. It is hard to control unwanted solar heat gain through west facing windows on summer afternoons so we simply kept the size and number of those windows to a minimum. Sunday, my wife, our four kids, and I went searching for flagstones in the creek that runs through our farm. Using a spud bar, even our youngest children were able to separate layers of thin silt stone that we then loaded in the back of our Polaris Ranger. (Tons of this stone gets busted up and washed down the creek with every heavy rainstorm, so our environmental impact was extremely low.) From previous expeditions, we already had about 2 pallets of flat stones in the back yard. But this time, we were trying to find really thin stones (3/8" to 1"), for use inside of the house. Siltstone is not as durable as slate, granite, or even limestone, but I think that with a good latex-enhanced mortar beneath it and a good sealer on top of it, the stone will work fine in our kitchen. And if a stone breaks two months (or two hundred years!) from now, replacements will be close at hand. Rocks just inches apart from each other varied widely in color. We found layers that were bright orange (from iron deposits?) as well as blue and buff layers. Monday, after the kids were off to school, my wife and I salvaged two more loads of rock before a near miss with a copperhead convinced us it was time to stop shopping and start building. We took our last load of stone to the house site and began experimenting with patterns and colors for the floor in the kitchen. Fairly soon, we realized that we didn't want to use really small stones, and that we preferred very thin mortar joints. After reading the directions on the grout bag, we think that perhaps our grout joints (between the stones) could be too thin for the grout to work properly. Oh well, we'll re-grout it with epoxy grout if the standard latex-enhanced stuff doesn't work. With this many stones fitted together, its too late to turn back now! So far we have at least 40 person hours invested in the floor, with less than 90 square trimmed, fitted, and bedded. And we still haven't grouted or sealed the stones. Definitely not the quick way to cover a floor, but it has been very fun and rewarding for my wife and I, as well as another good lesson for our kids (i.e. "everything doesn't have to come from China via Walmart or Lowes"). Whats more, I think this floor could last a lifetime. A while back, I posted some pictures of us installing radiant heat tubing between the floor joists and the sub floor. For months, this tubing has been hanging beneath the floor. But now, because its time to put some real ceilings in our house, I've finally started properly securing the tubing to the bottom of the sub floor. From my internet research, it looks like the heat transfer to the floor is twice as good with aluminum plates (40 btu/hr/ft) than without aluminum plates (20 btu/hr/ft). But pre manufactured aluminum transfer plates cost almost $1 a piece. A few thousand plates could equal a few thousand dollars! Instead of buying plates, we decided to fabricate them ouselves. Lowes sells one hundred 5"x7" pieces of aluminum roof flashing for $15. (Fifteen cents a piece - that's more like it!) We built a jig to speed up the bending process. It is possible to make between 100 and 200 radiant heat transfer plates per hour with this simple jig, which consists of a board with two strips of 5/8" plywood screwed to it. 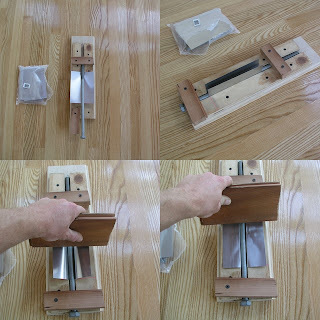 A 5/8" bolt helps form the plates into the wooden channel. Then we use a piece of hardwood flooring to crease the "wings" of the plate. It is possible that the radiant heat plates sold on the internet are made of a thicker gauge aluminum than our DIY aluminum plates, but I think these will function fine. I am slightly concerned that the plates could abrade the pex tubing as it moves due to thermal expansion and contraction, but the edges of these pieces of roof flashing are fairly dull, so it's probably not a big risk. I first used a manual stapler to attach the plates to the subfloor. Unfotunately, the manual stapler would not reliably drive the staples deep enough into the plywood and my hands were getting sore quickly (waaahhh). My Arrow electric stapler was even less powerful. So I borrowed a narrow gauge pneumatic stapler from my father-in-law. I turned the air pressure down to the lowest setting that would still operate the staple gun (70psi), and I set the depth control on the gun to minimal. Even with these adjustments, the pneumatic stapler would occasionally shoot the staple clear through the aluminum plates. No problem - shoot another staple - they're cheap and quick. The most tedious aspect of attaching the pex to the subfloor was dodging all of the flooring nails. The subfloor beneath the rooms with parquet and herringbone floors was peppered with thousands of sharp flooring nails sticking out everywhere. Fortunately, the flooring nails (technically they're called cleats) are made of crappy metal that breaks off just inside the plywood if bent back and forth a few times. After a full day of breaking off nails and stapling up aluminum plates, my neck was sore. (waaaaah... more whining). After attaching over 1000 of these plates to the bottom of the subfloor (and finding a few places where flooring nails had at least nicked the tubing), I wanted to pressure test the pex lines. To perform a pressure test, I bought the requisite pex manifold, fittings, and pressure gauge. Figuring out what to buy is tough if you've never seen the stuff before. I had to go through the whole pressure-test-thing once before when we poured the basement slab with the pex embedded, so this time around it was easier. Back then, to be on the safe side, I bought Wirsbo brand radiant heat components. This time, I bought Mr. Pex brand components because they're less expensive and of similar quality. I've included a picture of most of the goodies, as well as a close up of the inside of one of these manifolds, which might help someone else understand how the zone control valves work. Pressure test report (subtitled, how to repair punctured pex) to follow in a later blog entry.